I spent some more time with Zevanna Agha yesterday. I painted her skirt and tunic in two different shades of brown, washed the boiler with rust, washed the skirt and tunic with Devlan Mud, and drybrushed the boiler with gunmetal to pick out the edges. I am not certain I like the metal effect on the boiler. 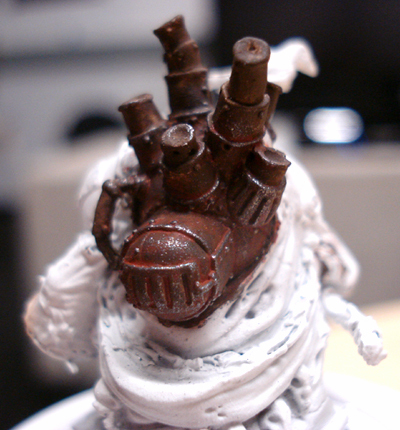 I am considering either washing the metal bits with dullcoat or Devlan Mud, or perhaps a drybrush with the Chocolate Brown I used as the basecoat of the iron. It’s a tough call, I’m not hurrying. I also am going to paint the stacks and the pipe with copper, and some of the shielding with brass, then add touches of Verdigris and black wash at the top. Next will be drybrushing the skirt and tunic with lighter shades and another wash. After that, I will paint the overcloak a dark blue washed with black, since I want her to look crowlike. I really want this figure to turn out. 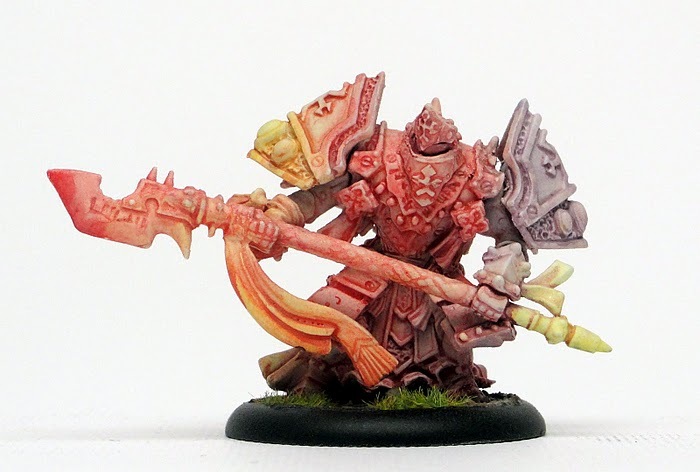 Someone on the Privateer Press Forums has a thread showing his Menoth army that his 8-year-old daughter is painting. I love it: I love the idea that he sold his old army so his daughter could paint a new one for him, and the effect is very, very entertaining. However, he is exposing his daughter to fundamentalist Menite teachings and he must be reported to the authorities. I was looking for a magnifying visor at Michael’s the other day, since my visual acuity is not what it once was (and I could have used the assistance back in the day, anyhow). They didn’t have visors, but they did have $10 pairs of magnification glasses (as in spectacles), much like my grandmother used for reading. 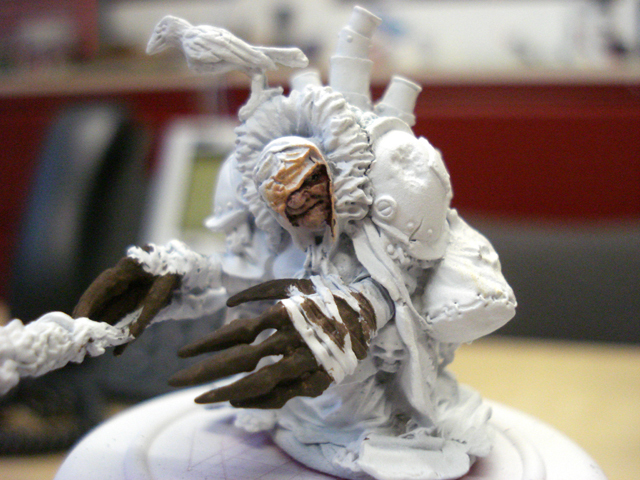 I have found them to be a tremendous help in seeing detail on the model and getting the paint in the right place. I bought the 2.5x magnification and have been very happy with the results. 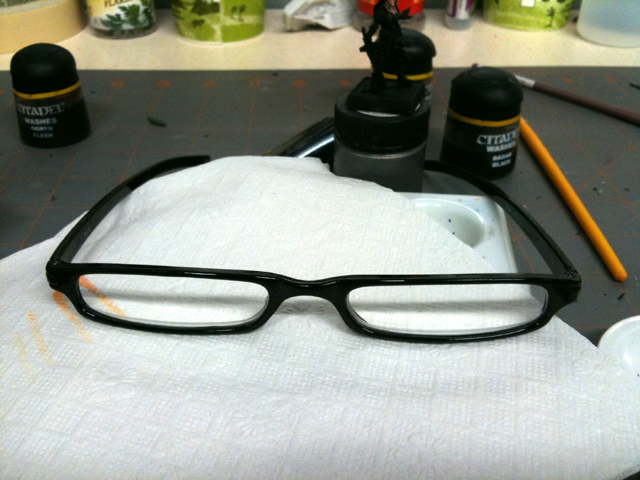 They go easily over my regular glasses, they are narrow so I can glance down at the palette without that view being out of focus, and the focal length is perfect for holding a miniature for painting. Best of all, I don’t look like a complete idiot while wearing them, and partial non-idiocy is my most realistic life goal. 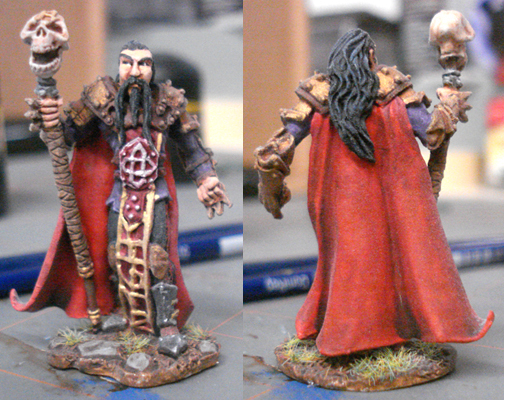 I finished the Evil Cleric from Reaper yesterday. Hannah wanted me to buy it because he looks like a friend of ours (no joke). 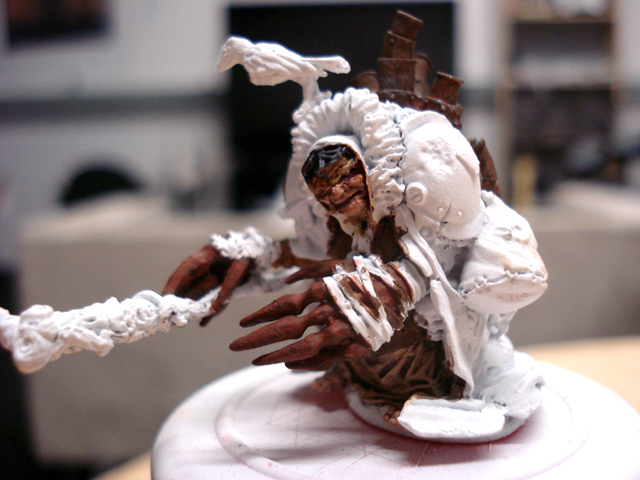 I forgot to photograph him until after I sprayed him with dullcoat, so thus the fine white fuzz. That will wear off with use. I’ll have to roll up an appropriate character at some point–we should have a D&D game starting soon at work. Ah, the benefits of working for a company that makes computer RPGs. I’m not overly thrilled with how he turned out, I especially wish the cloak was better, and I gave up on making the metal look right over the Stole or whatever the vestment is down the front; I started it over several times, in hindsight I maybe should have skipped the metallic. I also feel like it could use more contrast in value. I spent some time today working on the Old Witch. 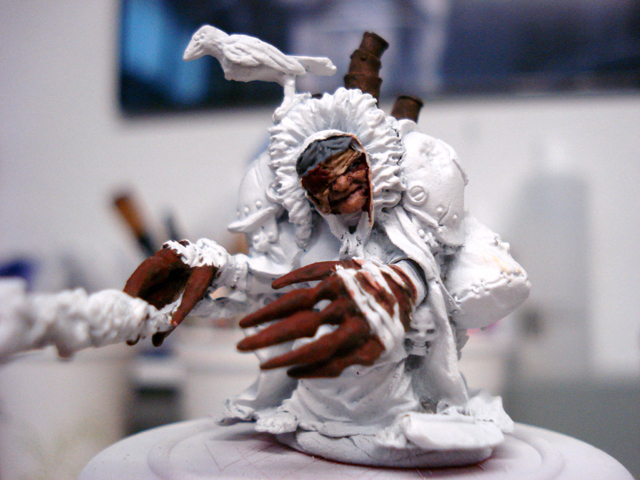 A few days ago I basecoated the claws with Vallejo Chocolate brown, basecoated the face with a red brown, then drybrushed her face with Brown Rose then Flat Flesh. I also painted in her eye. 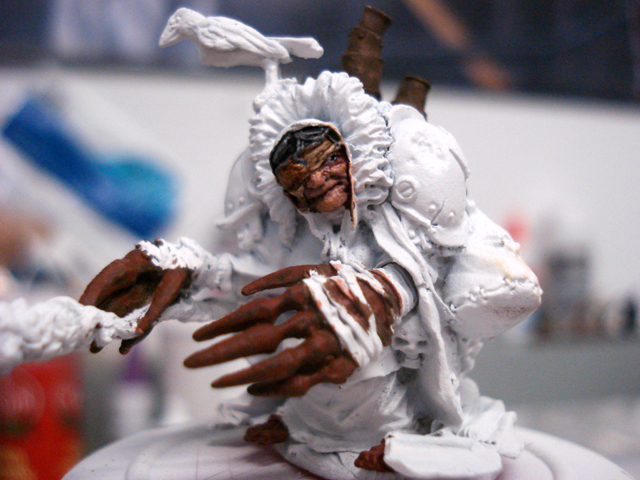 I washed the claws with a mix of orange and brown, and basecoated the cloth over her eyes with a very light sand color. 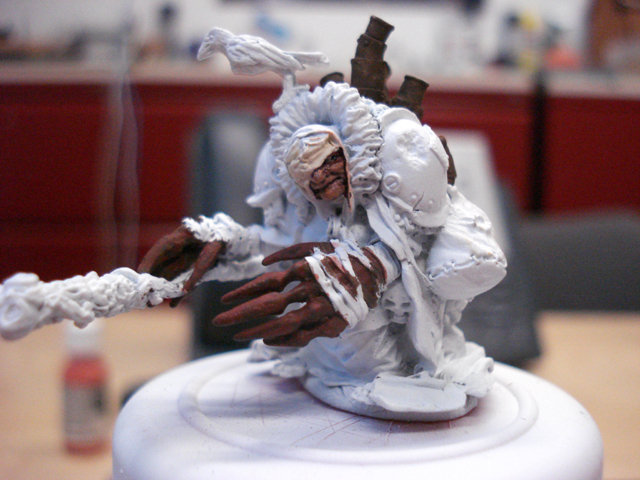 I washed the cloth with Devlan Mud and drybrushed the claws with a brighter orange. I painted her hair medium gray and washed with Badab Black. I highlighted the cloth across her eyes with a shade of sand slightly darker than the original. Then I painted the eyepatch with dark red brown and washed with with black. I didn’t like how the eyepatch looked, so I tried highlighting it with a drybrush of light brown, which looked even worse. So I thinned out some copper paint and painted it onto the eyepatch, drybrushed light gray on the hair, and added one more wash of Badab Black. I also started on the feet. I feel like the patch turned out well in copper. I am not sure about the hair, I might want to go lighter still. I really like the face, though. Next up, I am going to paint her skirt a dark red and the doublet a dark blue. 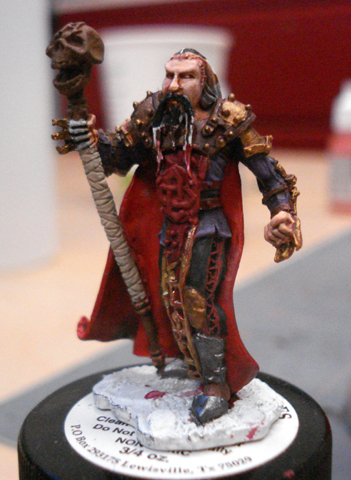 I also am almost finished with a RPG Evil Priest/Necromancer miniature I picked up. Yesterday, a coworker and I got in what was supposed to be a quick game of Firestorm Armada, but since it was only our second game, we had no idea what we were doing, and the game took hours. 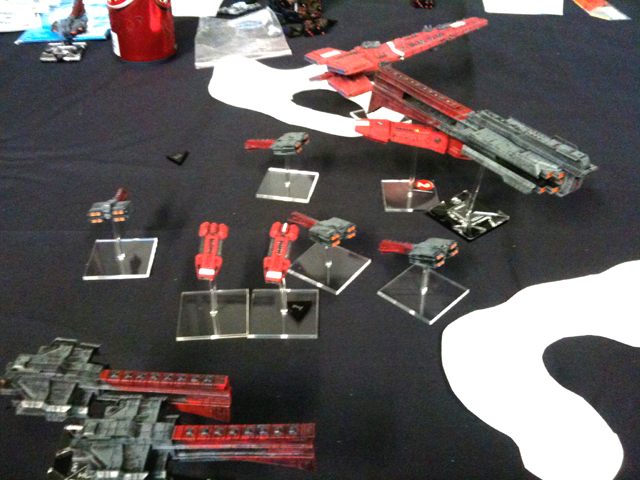 I played my Terran fleet, “Task Force Mars,” and Matt played his Dindrenzi. We had one planet that I had painted up, and another coworker cut some nebulae out of white paper: we decided the nebulae blocked LOS (halving Attack Dice), but had no effect on movement. I fared rather poorly, losing a lot of my ships early on, though I did manage to board and capture one Dindrenzi frigate using my Cruisers. In brief, I came out of the deployment zone and tried to move around one flank, using the planet and a nebula for cover, but we got hung up on one another near the planet, and traded a lot of volleys that left me without most of my ships. My Battleship then played cat and mouse with his remaining forces, and was actually slowly winning the battle of attrition with his battleship because my shields were working rather well–I had doubted the effectiveness of shields from reading the rules, but in practice they really made a difference, preventing several critical hits and even reducing all damage a couple times. Still, in the end, Matt had three Frigates (in two squadrons), two Cruisers, and a mostly-functional Battleship and was well-positioned to take me out next turn if we hadn’t run out of time after three or so hours of looking up rules (photo is from right before he dusted my last Frigates and the final Cruiser)! We hadn’t previously used the boarding rules, hadn’t used the Cut Engines maneuver, hadn’t used any sort of terrain, and hadn’t used a lot of torpedoes previously. Now we are little more familiar with those rules, though I feel like we didn’t really do the boarding properly: I should got to the Firestorm Armada forums and ask some followup questions. Next time we will use the fighter wings, and there will be much confusion.